Databases running in compatibility range, upgrade recommended. When you apply a hot fix to SharePoint 2010 you need to run a command to complete the patch otherwise you will see this message in Central Admin "Databases running in compatibility range, upgrade recommended" under Upgrade and Migration -> Review database status, under the Status column. To resolve this issue you need do the following. 1. Open an Administrative command prompt. CMD - Run as Administrator, or open the SharePoint PowerShell Command Window. Laura Rogers has posted it here! One of the basic things you would want to do with SharePoint Designer 2010 is editing the layout of the page. This seems easy enough, but when SharePoint Designer 2010 blocks access to the yellowish parts of the code it becomes quite impossible. This is for a good reason, and can be annoying at when you first use SharePoint Designer. To get around this issue you need to click on the Advanced Mode Ribbon button. Then auto-magically it's accessible and you can get the job done! After the Advanced Button is clicked, the server does some processing and then it allows access, which is evident when the yellowish background is removed! 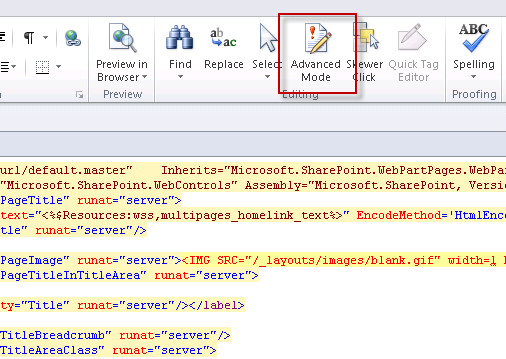 I came across a "File Not Found" error when attempting at access a SharePoint Page that had a custom Web Part. Not a very useful error message to say the least. So, in order to actually get more information you will need to have access to the Web.Config file. "C:\inetpub\wwroot\wss\Virtual Directories\<your web app's virtual directory>"
Open web.config using in your favourite editor. You should now see the problem in the Call Stack and have enough information to know what the problem is or could be. When you have fixed the problem you may need to so a iisreset to see the site again. Finally, you will need to revert all of those changes to the Web.Config file so that the user doesn't see "Too Much Info"!